Reflecting back on 2006, I began with great intentions of trying to summarize the world of diabetes research in much the same way as I did last year (see my post from January 5, 2006 to see last year's review here). However, it occurred to me that the more things changed, the more things stayed the same (unfortunately). I have chosen to focus on the ultimate objective by asking a simple question: "Will this research or development move people with type 1 diabetes towards a cure, or did it make treatment any easier or more effective?" The answer must be "yes" to deserve mention, and it should not merely be incremental (proving or expanding on something already suspected, etc.) but truly groundbreaking. Reviewing the results for type 1 diabetes news and research during 2006 was an exercise in both optimism and frustration. Optimism because researchers have indeed made quantifiable progress in chipping away at the many unknowns related to this disease, and with each discovery, there is new hope that we are one step closer towards a cure. But frustration stems from the fact that we're still not cured, and the long-term threat of complications still loom even for patients who manage their condition very well (the DCCT showed a reduction, but failed to eliminate complications completely). But more frustrating than the threat of complications is a practice of "blaming the patient" for diabetes-related issues which seems so prevalent among the largely ignorant general population, as well as many doctors and diabetes educators who frankly, should know better. James Hirsch, the author of the book "Cheating Destiny" summarized this poignantly in chapter 3 entitled "The Burden of Control" which he essentially argues that the burden of control has not been fully recognized by the medical profession. In his book, he writes " ... doctors need to recognize the heavy demands of rigorous management - financial, emotional, and physical - while acknowledging that misjudgements - sometimes small, sometimes large - can never be eliminated completely." He closes the chapter with a very fitting quotation from someone I consider a personal friend, Deb Butterfield, who wrote the book "Showdown With Diabetes": "Certainly control is important ... [but] the expectations that have been propagated by the DCCT obscure the truth that diabetes is the problem, not the people who have it." For many years, Deb was one of the few voices representing patients in the diabetes arena, and a rare voice willing to critique the medical profession, while also giving credit where due. But with the advent of the Internet and blogging, patients voices are increasingly being heard, and patients with diabetes are indeed changing the paradigm on how diabetes is viewed. This is consistent with Time magazine naming "You" as the 2006 Person of the Year. But this is more than a cliche. No longer are doctors, clinicians and nurse educators the sole voice of authority on this subject; today patients and the media have easy access to other patients who have literally been there and done it before for advice and recommendations based on first-hand experience rather than controlled clinical trial results. Plus, news on research development related to curing this condition now move with instantaneous speed, and patients are increasingly using their clout to push political agendas related towards their needs, all thanks to the Internet uniting people from every corner of the world electronically who might never have had an opportunity to meet in person. 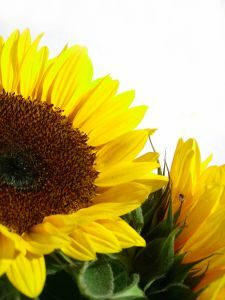 "Whatever the reason, there is now a handful of diabetes memoirs that suggests a similar awakening in others. Last August, when Holt released Ms. Roney's book, W. W. Norton & Company published 'Showdown With Diabetes,' by Deb Butterfield, an account of her successful pancreas transplant and her anger over what she sees as the traditional view that diabetes should be managed rather than cured. In 1998, Scribner came out with 'Needles: A Memoir of Growing Up With Diabetes,' in which Andie Dominick describes her complicated relationship with her older sister -- both siblings were found to have diabetes as children -- and the reckless behavior, including drug abuse, that contributed to her sister's death. All three authors, whose cases were diagnosed as juvenile, or Type 1, diabetes, address the burden of having a potentially fatal condition they say they were expected to keep under wraps." Therefore, my pick for top development of 2006 is the impact the Internet has had on uniting people with diabetes and giving them an opportunity to have their voices and concerns heard, which was unprecedented until fairly recently. I expect that this trend will continue into the future, perhaps uniting patients representing different conditions (such as MS and type 1 diabetes supporting common mutual interests, such as expansion of current federal policy on embryonic stem cell research, or perhaps ensuring that the Department of Health and Human Services and the NIH continue to receive their fair share of our federal tax dollars). While this process has been building for several years, today we have unprecedented access to one another thanks to things like The Diabetes OC and The Diabetes Blog Network, as well as numerous message boards and communities (including the ADA Message Board, the dLife Forums, DiabetesTeenTalk.com, DiabetesTalkFest.com, DiabeticDiscussion.com, the Islet Foundation Public Message Forum, the MSN Communities Diabetes Message Board and many others I have yet to discover). Even more importantly, we also have increasing access to mainstream media outlets with outlets like the BlogBurst Network, giving patients access to mainstream media which would have been inconceivable just a few years ago. Patients with diabetes have made an undeniable mark on conventional diabetes treatment by adopting the Internet as a way to unite and even help make a once invisible disease visible with sites like Diabetes Made Visible. This influences the speed at which information is disseminated, which is now lightning-fast (sometimes to the chagrin of doctors and practitioners, some of whom became accustomed to being viewed the only authority on the subject of diabetes treatment) and also gives patients access to information beyond what the clinical trials suggest, as first-hand experience often trumps what tightly-controlled clinical trials reveal (especially when trial subjects have access to healthcare advice and professionals that real-life patients often do not). On the treatment and research front, insulin replacement remains the very basis of treatment for type 1 diabetes, but there is no denying that its not a very good replacement for fully functioning beta cells, as patients are left very susceptible to errors leading to less-than-perfect control when insulin is not delivered in a completely physiological manner. While insulin analogs are slightly better at matching food metabolism than the earlier insulin varieties, they are still pretty far from what they need to be. Its worth mentioning that insulin (all varieties) is the FDA-approved "drug" with by far the most adverse effects requiring emergency room treatments according to Table 5, in the "National Surveillance of Emergency Department Visits for Outpatient Adverse Drug Events," Journal of the American Medical Association, Oct. 18, 2006-Vol. 296, No. 15.). According to that publication, insulin is responsible for some 58,000 emergency room visits each year. Hypoglycemia is easily the most common "adverse effect" but certainly not the only one. Allergic reactions and lipodystrophy are adverse that insulin analogs combined with diabetes education have failed to alleviate. This shows that artificial insulin replacement can never truly be an adequate subsitute for fully-functional pancreatic beta cells, and that current treatments still have unfulfilled voids which need much more attention from doctors and researchers. One of the most noteworthy milestones reported during 2006 was a reduction in nephropathy (kidney failure). Together, diabetes and high blood pressure account for an astonishing 72% of all new cases of kidney failure. Arguably, one of the most severe complications of diabetes, for nearly 20 years, the rate of annual increases in this particular complication was between 5%-10%. However, the most encouraging trend in nephropathy was seen in diabetes cases, where the rates for new cases of kidney failure among caucasian patients under age 40 is now the lowest level observed in 20 years! Researchers like to attribute this to improved control of blood glucose and blood pressure, and no doubt this is one of the more important factors. However, the use of anti-hypertensive drugs such as ACE inhibitors to prevent or delay kidney failure is as important, if not moreso, given the abundance of scientific evidence proving the beneficial effects these drugs have on the kidneys. With proper care, fewer than 10% of people with diabetes will develop kidney failure. 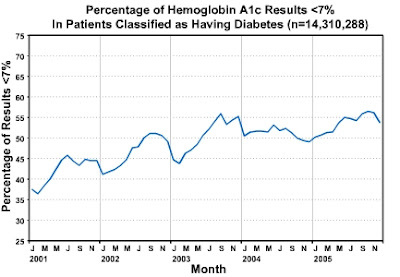 This is consistent with the finding from the Quest Diagnostics Health Trends™ Diabetes Report, which in May 2006, reported that people with diabetes who regularly visit health professionals are doing a better job of managing their disease based on 14.3 million test results from 2001-2005 from the nation's largest database of clinical lab results. Of course, an ominous threat is looming, notably, the rapid growth of uncontrolled type 2 diabetes, especially among lower-income minorities who often lack access to proper basic care (see my previous post on World Diabetes Day which outlines some of the challenges the uninsured have, many of whom are employed, when it comes to receiving diabetes care). For example, a meta-analysis of 11 studies that compared HbA1c levels between blacks and whites showed blacks averaged 0.65% higher HbA1c levels than whites according to Julienne Kirk, Pharm.D. his and colleagues as reported in the September issue of Diabetes Care. They found that blacks with diabetes have worse control of blood sugar than whites, a factor that may help explain the disease's disparity between African Americans and Caucasians in morbidity and mortality, according to researchers at Wake Forest University. This trend could rapidly erase the recent gains made in new cases of kidney failure among diabetes patients. At the 2006 JDRF State of the Foundation Address held in May, CEO Arnold W. Donald highlighted a few areas worth mentioning. Mr. Donald said "... beta cell regeneration, which is increasingly one of the more promising cure therapeutic areas, even though this field barely existed five years ago" had made significant strides in the past year. While JDRF-funded research indeed achieved some progress in this arena, I would call attention to the fact that the field is much, much larger than JDRF. In my opinion, some of the most significant progress was made by people without JDRF funding, some by design, others in spite of it. Regardless, no update on this matter would be complete without noting Dr. Faustman at Massachusetts General Hospital. In March three groups reported separately in the journal Science that they had repeated Dr. Faustman's protocols and reproduced her most important result, stopping the disease process in about half their mice and getting the animals to recover normal function. Then, in November, the results from a study performed at the National Institutes of Health (NIH) were also published in Science which confirmed the role of the spleen cells in beta cell regeneration. Her supporters like to point out that she was right all along, but the reality is that scientific replication is required and without it, one will struggle to obtain funding. At present, there still is no scientific evidence that her success with the NOD mouse will necessarily translate into success in humans. But her work was validated by a number of independent researchers this year (some funded by JDRF, others independently). This suggests success that the human clinical trials which are likely to begin in October 2008 (given that the completion of the blood assay and the automation of the equipment needed to execute the BCG Human Clinical Trial will probably not be finished until then) will be considered worthy of further investment. Arguably, the Iacocca Foundation has been responsible for nuturing this work thus far, but once the initial human clincal trials begin (assuming that we learn something from it) I am optimistic that they may find it considerably easier to obtain funding for the next phases of research necessary. There was also continued progress made in the area of beta cell transplantation, as it has now become possible to transplant beta cells further away from a beta cell isolation center, potentially opening access to this form of treatment to people located further away from major diabetes research/treatment centers. Similarly, researchers are now able to successfully transplant fewer beta cells while still achieving insulin independence, at least initially. On the down side, we now have evidence that beta cell transplantation does not provide long-term insulin independence for patients with type 1 diabetes as full pancreas transplantation does. Two years after receiving transplants of insulin-producing beta islet cells, only 5 of 36 (or just under 14%) of patients with type 1 diabetes remained free of the need for insulin injections, reported Canadian investigators in the Sept. 28, 2006 issue of the New England Journal of Medicine. That means that most patients in the small trial sooner or later reverted to exogenous insulin, although the transplanted cells continued to protect the majority of them from severe hypoglycemia and also helped patients to maintain lower levels of glycosylated hemoglobin (HbA1c), according to research by A.M. James Shapiro, M.D., Ph.D., of the University of Alberta in Edmonton, and his colleagues. While the research published this year suggested that long-term brain damage does not occur when hypoglycemia occurs, a very recent study did reveal that hypoglycemia leads to age-related vision loss published in the December 11, 2006 issue of the Proceedings of the National Academy of Science (Proc Natl Acad Sci USA, Published online 2006 December 11. doi: 10.1073/pnas.0604478104). Although no one is predicting that stem cell research (adult, embryonic or otherwise) will produce a cure overnight, as I wrote in December, the Australian Parliament had just passed legislation overturning a ban on therapeutic cloning, paving the way for scientists to pursue regenerative medicine and stem cell therapies in that country. One of the first targets for embryonic stem cell research in Australia will likely be a cure for type 1 diabetes according to a top Australian researcher, who predicts major progress within 4 years. We'll see, but at least progress is being made while it has essentially ground to a halt in the U.S., with lawsuits continuing to limit California's ability (for the time being) to fund it via the mandate dictated by voters in 2006 with the passage of Proposition 71. Naturally, December 2006's news that scientists at a Toronto hospital reported that they now have proof the body's nervous system helps trigger type 1 diabetes generated a lot of Internet excitement, but we should view discoveries made on mice with skepticism, as type 1 diabetic (NOD) mice now have at least a dozen viable cures, none of which has translated into human success. However, this discovery opens the door to potential new ways to either treat or cure the disease. I look forward to additional research progress in the future. Looking Ahead on the Treatment Front: A Return to "Regular" Insulin? Don't laugh, this could very well happen within the next few years, and remember: you heard it here first! But research is now underway for not one, but two forms of insulin that are structurally the same as regular human insulin, yet have many of the same absorption, distribution, metabolism, and excretion (known as "ADME" in pharmaceutical industry lingo) characteristics of insulin analogs. Insulin analogs, which were first introduced in the U.S. back in 1996, were hailed by the manufacturers as a "breakthrough" in the treatment of type 1 diabetes. 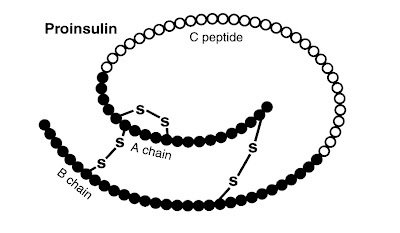 Through genetic engineering of the underlying DNA, the amino acid sequence of insulin molecule is altered slightly to improve its ADME characteristics. But insulin analogs are artificial derivatives of the natural hormone insulin, and their long-term safety remains unknown to this day. Some patients have complained of reduced hypoglycemia awareness since using analogs, while others have found that insulin analogs cause injection site irriation or other allergic reactions. And analogs have not received universal praise. In May 2004, the Cochrane Review of short-acting insulin analogs vs. regular human insulin in patients with diabetes suggested only a minor benefit of so-called "rapid" acting insulin analogs in the majority of diabetic patients treated with insulin. They concluded that until long term efficacy and safety data are available that a cautious response to the vigorous marketing of insulin analogs be taken, largely due to fears of potentially carcinogenic and proliferative effects. Cochrane also found that many of the studies that were carried out on insulin analogs were of 'poor methodological quality,' and that few patient-related issues were even investigated, including patient satisfaction, health related quality of life or diabetes complications and mortality. Hypoglycemic "adverse" events were reported in a mere 40% of the studies examined. In spite of the concerns raised by the Cochrane Review, a majority of patients have adopted insulin analogs. In fact, the widespread adoption of this class of insulin in clinical practice suggests that much of the health care community believes in the use of insulin analogs. Several studies indicate that insurers are paying for insulin analogs at the same level as regular insulins, and there is also evidence of widespread adoption among clinicians, some of whom no longer prescribe any human insulins. But insulin analogs aren't quite perfect. John Walsh, the author of the book "Pumping Insulin" summarized the main criticism of insulin analogs best: "Although called 'rapid insulin', Novolog and Humalog are not that fast, having little effect on the glucose for the first 15 to 20 minutes, reaching a halfway point in activity at just over two hours, and then trailing off in activity over about 6 hours." Two new "regular" insulin formulations are called Basulin® and Viaject™ and are being developed by two different companies. Flamel Technologies, S.A. is a France-based biopharmaceutical company (U.S. headquarters are in Washington, D.C.) principally engaged in the development of two unique polymer-based delivery technologies for medical applications. Flamel's Medusa® technology is designed to deliver controlled-release formulations of therapeutic proteins and peptides, including a new, basal insulin formulation the company calls Basulin. The important difference is that Basulin would deliver controlled-release regular human insulin, rather be a genetically-modified synthetic human hormone. The Medusa system, according to Flamel, reduces the effects of denaturation on injected insulin. When proteins and peptides are injected into the body, their effectiveness is degraded somewhat. The Medusa system encapsulates injected insulin with a "protein-like" compound that protects the insulin proteins from denaturation. Bristol-Myers Squibb agreed to to pay Flamel Technologies a $20 million up-front payment and $145 million in additional milestone payments for a total of $165 million. Bristol-Myers Squibb will also pay double-digit royalties to Flamel on Basulin sales. The company has made considerable progress to date, and so far, the results are positive. Back on August 27, 2003, Flamel announced that it had entered into a licensing and commercialization agreement to develop and market Basulin with Bristol-Myers Squibb Company. If Basulin makes it to commercialization, this would be a return of sorts for Bristol Myers Squibb, as one of its predecessor companies, E.R. Squibb & Sons, Inc., sold insulin until the early 1980's. Under the terms of the Flamel agreement, Bristol-Myers Squibb will lead, and assume the cost of, the future development and manufacturing efforts for Basulin and will also have worldwide exclusive rights to the product. Flamel will continue to provide additional support for certain activities as the product moves forward in development. Last year, on February 7, 2005, Flamel Technologies published the results of Phase IIa clinical trial on Basulin, and the results showed the Basulin formulation confirming the results obtained in previous Phase I study in terms of good safety profile (including local tolerability), 24 hour release of human insulin, and good glycemia control. Further clinical development and clinical trials (the FDA requires 3 phases of human clinical trials) must be conducted to confirm the therapeutic performance, efficacy and safety of Basulin, and that is the next and possibly the final stage of trials required before FDA approval may be attained. Clearly, the early success suggests that in the not-too-distant future, we could see a new basal insulin from a very old name in insulin. At the other end of the extreme, another company called Biodel Inc., which is a privately-held biopharmaceutical drug delivery company based in Danbury, CT that develops drug delivery technologies which increase drug efficacy, enhance drug performance, and make drugs easier for patients to take is working on a potentially even more rapid insulin than today's analogs (Humalog-insulin lispro, Novolog/Novorapid-insulin aspart, or Apidra-insulin glulisine). Biodel rapid-acting insulin formulation called Viaject supposedly can produce the desired spike-like effect needed for postprandial glucose control better than current insulin analogs, reaching peak efficiency faster. They claim that their own clinical trials comparing Viaject to the other available products work faster than products currently available. Furthermore, unlike other relatively rapid acting insulin analog products, the effects of Biodel's products end between two and three hours after they are taken, which approximates the time frame in which the absorption of glucose from a meal ends. Based on personal experience, I can tell you that some analogs, such as Novolog/Novorapid (insulin aspart rDNA origin) continue working for at least 6 hours. The key here is that Viaject is regular insulin with so-called "unique additives" that make it absorb much more rapidly. The company claims that its studies show Viaject absorbs faster than Humalog, granted only only a few minutes faster, but even that is an improvement. The company is planning to test this new insulin in 66 centers across the U.S. More details can be found at www.clinicaltrials.gov. Another benefit the company is claiming is that Viaject demonstrates "lower variability in action than both Humulin Regular and Humalog." Basulin has a slight first mover advantage to given it has already completed the first 2 phases of FDA-mandated human clinical trials, therefore if all goes well, the third phase could begin in 2007. I would anticipate we could see the first phase of human clinical trials for Viaject begin as soon as 2008. In my humble opinion, the biggest diabetes "Dud" of 2006 was inhalable insulin. Billions of dollars have been invested (wasted?) in inhable insulin, the first one being Pfizer's Exubera. In May 2006, Novo Nordisk acquired full development, marketing to the AERx insulin Diabetes Management System (iDMS), while rival Eli Lilly and Company has partnered with Alkermes, and Bristol-Myers Squibb has signed an agreement this year with QDose (a joint venture between Aradigm, Inc. and Quadrant Drug Delivery, Ltd.) licensing agreement for the QDose inhaled insulin product. Bristol-Myers Squibb will obtain worldwide exclusive rights to the product and, with support from QDose, will take the lead on development, manufacturing and commercialization of the licensed product. According to CEO Kieran Murphy, QDose's product was designed by Danish firm Bang & Olufsen Medicom to mimic the shape of a mobile phone, and they claim the QDose device is also much more discreet and user-friendly than Pfizer's Exubera device (Fellow D-Blogger Amy Tenderich once referred to it as a bong!). What more can I possibly say about this development? Fundamentally, it offers nothing other than avoiding a needle, but no clinical advantage over existing insulin formulations, and it will cost much, much more (see my previous posts entitled "Irrational Exubera-nce for Exubera" and "Inhalable Insulin May be a 'Flop'" for my previous posts on this topic, as well my previous editorial entitled "Why Big Pharmaceutical Companies' Current Nanotech Efforts Should Fail" for more details on my opinion on this topic). Researchers from Johns Hopkins University conducted a cross-sectional analysis of 7,424 adults aged 40-74 years, from the third National Health and Nutrition Examination Survey (NHANES) and concluded that being short - specifically having short legs and a low leg length-to-height ratio - is linked to an increased type 2 diabetes and obesity risk in middle age. They recommend "early intervention" to improve childhood nutrition in diabetes prevention. While this was a meta analysis, it still suggests that the parents are to blame for adults getting type 2 diabetes, which may be a flawed conclusion. This study garnered 42.9%, with "Effect of Medication Nonadherence on Hospitalization and Mortality Among Patients With Diabetes Mellitus" garnering 28.6% of the votes, and "Lifestyle Intervention Is Associated With Lower Prevalence of Urinary Incontinence: The Diabetes Prevention Program" and "Prevention of Hypoglycemia During Exercise in Children With Type 1 Diabetes by Suspending Basal Insulin" each garnering 14.3% of the voites. I should note, however, that the general consensus was that it was hard to choose one winner, as they all were agreed to be "dumb"! See my previous post here for more detailed descriptions, or the page where the votes were collected here. Terrific roundup and reporting, as always. Fantastic 2006 RoundUp here, Scott. Seriously. Thanks for this post. It was very informative. Thank you Scott for articulating so well and thoughtfully on the current state of affairs regarding T1DM. I look forward to the clinical trials regarding Basulin as well as continued stem cell research to yield more practical applications for T1DM rather than just theoretical ones. Thank you everyone for your feedback! BTW, I look forward to some new insulin varieties sooner rather than later. In particular, I really hope Bristol-Myers Squibb returns to the insulin market, as 3 manufacturers is really not competition. It remains to be seen as to how Biodel's Viaject is to be commercialized; small companies like them usually sign partnership arrangements with one of the bigger players, but they're further away from commercialization than Basulin is, so we'll have to see. It is also theoretically possible for a company like Teva (the generic titan from Israel) to emerge, but so far, few rumblings about their interest in the insulin market. The FDA's lack of guidelines on generic biopharmaceuticals may be discouraging them. I am planning to post an article (for download) I've written on this topic in the near future. Great roundup Scott. You are really really talented with this kind of thing, and I know I very much appreciate your take and opinions on "things".